CJ's Thumbs Up Foundation: Time for the annual posting of the "Disney Letter." Time for the annual posting of the "Disney Letter." 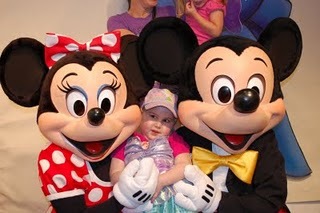 In the spring, we were approved for a Make-A-Wish trip. When asked what she would do if she could do anything in the world, she answered, “Go where the princesses are.” (Meaning Disney World, of course). We were planning to go possibly after the first of the year, after the majority of her current treatments were finished but in November we learned the worst. After all the surgeries, chemo, and radiation, the tumor was still growing. And it had moved to the brainstem. We were out of options and it was the opinion of our medical team that we needed to think in terms of weeks and not months. We arrived safe and sound and headed off to the Magic Kingdom the next day (Wednesday, Dec. 2). We were told the Disney staff would offer extra help to MAW families. We had no idea how deep Disney’s commitment to MAW would be. We were ushered to the front of lines all day and given preferential treatment everywhere we went. Characters went out of their way to visit with us and cast members seemed to seek us out to ask if we needed anything. We felt very well cared for. Topping the list of amazing events for us were the character visits with Mickey and Minnie and then with the Faries Silvermist, Tinkerbell, and Rosetta. We arrived at the area to see Mickey and Minnie in the morning and toured both of their houses first. When we walked into the “barn,” it was almost an accident. This was our first experience with bypassing the long lines and we couldn’t believe it when we were actually walking into the room with Mickey and Minnie after waiting less than 10 minutes. I can’t imagine that this letter might make it’s way to the specific cast members with whom we came in contact but if so, please let them know that they have touched our lives and become permanent pieces or our memories forever. I’m sure they do it everyday and yet might not realize their impact.